Dit blijkt uit een gerandomiseerde Europese fase III studie in 47 ziekenhuizen (waaronder NKI / AvL Amsterdam en het Catharina Ziekenhuis Eindhoven) bij totaal 413 prostaatkankerpatienten. De studie is gepubliceerd in The Lancet Oncology, De studie is uitgevoerd onder leiding van de Franse Prof Abdel-Rahmène Azzouzi. Schematic diagram of treatment plans and corresponding Day-7 MRI results. 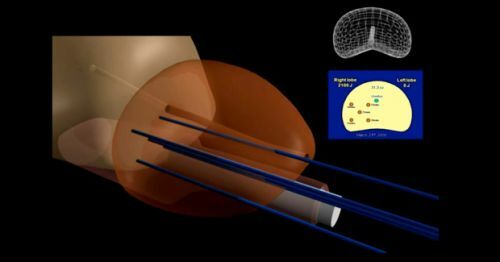 The three treatment plans for focal therapy of low-risk, early stage prostate cancer by WST11-mediated VTP therapy, which were considered by the Treatment Planning Guidance Committee, are displayed. 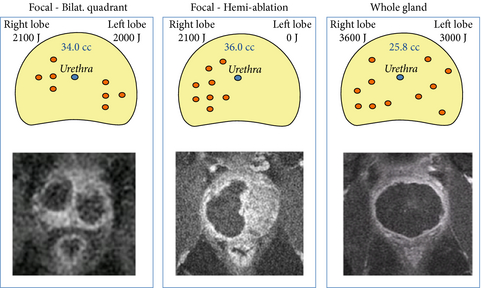 The possible different fibre configurations used are shown.The red circles indicate the possible location of the fibres; the blue circle indicates the position of the urethra in the prostate gland. The corresponding MRIs, taken on Day-7, are shown underneath. De PDT - Fotodynamische therapie bestond uit het gebruik van de fotosensitizer padeliporfin (TOOKAD® Soluble Vascular Targeted Photodynamic therapy (VTP)) in een dosis van 4 mg / kg intraveneus gedurende 10 minuten samen met optische vezels ingebracht in de prostaat in de behandelingszone. Daarna werd de behandelingszone belicht door laserlicht van 753 nm met een gefixeerde kracht van 150 mW/cm gedurende 22 minuten en 15 seconden. Met intervallen van drie maanden werd de PSA gemeten en vond daarnaast een digitale en een handmatige controle plaats. Op 12 maanden volgde een biopt. Na 2 jaar werden de studiersultaten geanalyseerd. Met dus meer dan uitstekende resultaten op ziekteprogressie en negaiteve biopten. Wel waren er wat meer bijwekeringen bij patienten uit de PDT groep maar die waren minimaal en goed behandelbaar. Conclusie van de onderzoekers is dan ook dat PDT - Photo Dynamische Therapy gericht op de bloedvaten bij prostaatkankerpatienten in een wait-and-see beleid kan behoeden voor een prostaatverwijdering en verdere radicale behandeling. Zie voor alle cijfers het abstract hieronder. Vascular-targeted photodynamic therapy was associated with a lower rate of disease progression in men with low-risk prostate cancer. The treatment approach was well tolerated, and it may allow men to consider a tissue-preserving approach and defer or avoid radical therapy. Het volledige studierapport: Padeliporfin vascular-targeted photodynamic therapy versus active surveillance in men with low-risk prostate cancer (CLIN1001 PCM301): an open-label, phase 3, randomised controlled trial is tegen betaling in te zien of te downloaden. Deze reviewstudie van PDT - Photo Dynamische Therapy op de in bloed circulrende tumrocellen : Vascular targeted photochemotherapy using padoporfin and padeliporfin as a method of the focal treatment of localised prostate cancer - clinician’s insight is wel als volledig studierapport in te zien. World J Methodol. 2016 Mar 26; 6(1): 65–76. Phase No. of patients Photosensitizer Radiation Ref. Hier de abstracten van de studies met een referentielijst. Padeliporfin vascular-targeted photodynamic therapy is a safe, effective treatment for low-risk, localised prostate cancer. This treatment might allow more men to consider a tissue-preserving approach and defer or avoid radical therapy. Vascular-targeted photodynamic therapy, a novel tissue-preserving treatment for low-risk prostate cancer, has shown favourable safety and efficacy results in single-arm phase 1 and 2 studies. We compared this treatment with the standard of care, active surveillance, in men with low-risk prostate cancer in a phase 3 trial. This randomised controlled trial was done in 47 European university centres and community hospitals. Men with low-risk, localised prostate cancer (Gleason pattern 3) who had received no previous treatment were randomly assigned (1:1) to vascular-targeted photodynamic therapy (4 mg/kg padeliporfin intravenously over 10 min and optical fibres inserted into the prostate to cover the desired treatment zone and subsequent activation by laser light 753 nm with a fixed power of 150 mW/cm for 22 min 15 s) or active surveillance. Randomisation was done by a web-based allocation system stratified by centre with balanced blocks of two or four patients. Best practice for active surveillance at the time of study design was followed (ie, biopsy at 12-month intervals and prostate-specific antigen measurement and digital rectal examination at 3-month intervals). The co-primary endpoints were treatment failure (histological progression of cancer from low to moderate or high risk or death during 24 months' follow-up) and absence of definite cancer (absence of any histology result definitely positive for cancer at month 24). Analysis was by intention to treat. Treatment was open-label, but investigators assessing primary efficacy outcomes were masked to treatment allocation. This trial is registered with ClinicalTrials.gov, number NCT01310894. Between March 8, 2011, and April 30, 2013, we randomly assigned 206 patients to vascular-targeted photodynamic therapy and 207 patients to active surveillance. Median follow-up was 24 months (IQR 24–25). The proportion of participants who had disease progression at month 24 was 58 (28%) of 206 in the vascular-targeted photodynamic therapy group compared with 120 (58%) of 207 in the active surveillance group (adjusted hazard ratio 0·34, 95% CI 0·24–0·46; p<0·0001). 101 (49%) men in the vascular-targeted photodynamic therapy group had a negative prostate biopsy result at 24 months post treatment compared with 28 (14%) men in the active surveillance group (adjusted risk ratio 3·67, 95% CI 2·53–5·33; p<0·0001). Vascular-targeted photodynamic therapy was well tolerated. The most common grade 3–4 adverse events were prostatitis (three [2%] in the vascular-targeted photodynamic therapy group vs one [<1%] in the active surveillance group), acute urinary retention (three [2%] vs one [<1%]) and erectile dysfunction (two [1%] vs three [1%]). The most common serious adverse event in the vascular-targeted photodynamic therapy group was retention of urine (15 patients; severe in three); this event resolved within 2 months in all patients. The most common serious adverse event in the active surveillance group was myocardial infarction (three patients). Reageer op "Prostaatkanker: PDT - Photo Dynamische Therapie op de bloedvaten bij prostaatkankerpatienten met een wait-and-see beleid geeft op 2 jaar verdubbeling 28% vs 58% van progressievrije ziekte in vergelijking met wait-and-see beleid"